I'm sure everybody knew this except me, but I never realized that pubic hair can turn grey. Yes, I'm naive. You don't have to tell me...I hear it all the time from loving friends. But seriously...who knew? I was surfing around the Vermont Country Store's new Winter products on their website this afternoon and in their apothecary section I came across Colour For Down Under. It's a dye to color your pubic hair...y'know...down there. Can you imagine? Like all products featured on this great site, there is a section for customer testimonials. Needless to say, no one has posted a comment yet. Hmmm. I wonder what they would say if they did? And now all that keeps looping in my head is that Clairol jingle from the 70's: "I'm gonna wash that grey right out of my head." I understand maybe some people don't like to have grey hair because it makes them look older than they want to look. I also know there are women who go through torturous waxing sessions to be well groomed for their partner, but dying pubic hair is a little too freaky for me. I wonder what Andy Rooney would say about this? Think I'll go send 60 Minutes an email right now. I'm lucky enough to be on vacation from work until January 5th. That's eleven solid days away from the office, but whose counting? I've looked forward to this stretch of time off from work for months. It's been the proverbial carrot dangling in front of my face during so many difficult days at the office when I just wanted the day to end so I could go home and relax. Now that the Christmas break is here and underway, I thought it would only be appropriate to take a moment to reflect on what's been accomplished being that there are now only six days left of my vacation. Are you seeing a pattern here? I've burned through five days already and haven't really gotten anything of substance accomplished. I've been living the life of a lazy person and it feels kind of weird. I feel like I should be doing something meaningful like painting our spare bedroom or going out shopping or organizing my sock drawer. But I know that I'm being too hard on myself. I'm doing exactly what people are supposed to do when they're on vacation - absolutely nothing. Even though I know this, it still feels weird. I've got the shakes and only a To Do List will calm my nerves. Pretty soon my remaining six days off from work will be down to three and eventually I'll find myself come Sunday afternoon being thoroughly dumbfounded that I didn't accomplish one real thing during Christmas break. I must be mindful to squeeze out as much as I can in these remaining six days. Screw it - I'm going back to bed. Christmas was pretty great this year. My sister-in-law Katie gifted me some incredibly thoughtful stuff like a fancy stylus for my iTouch because I have fat fingers, a Bubble Wrap 2009 Calendar, the complete Little Britain series on DVD and my favorite gift of all - My Beating Heart . It's a small fuzzy pillow in the shape of a heart and it has a tiny computer inside that mimics a beating heart. You turn on the pillow and it beats for 20 minutes and then shuts itself off. Every time you turn on the pillow, a different heart rhythm occurs. It's suggested that if you hold the pillow close to your own heart it will start keeping pace with the pillow artificial beat. I've used it a few times and it's the most astonishing thing - it actually relaxes me. I find myself focusing on the vibration of the beating heart and before I know it, I'm out like a light. Complete relaxation. I'm on vacation next week so I plan to do my share of heavy afternoon napping. You can bet this lovely pillow will be cuddled up against me along with Spencer and the fat beagle, of course. I can't recommend this pillow enough. Valentine's Day is only a few short months away and I think this would be the perfect gift. Screw the box of chocolates. Give me this pillow and a package of 9-volt batteries and I'll love you forever. Now that it's officially Christmas Eve, I thought it only appropriate to share the above picture with my readers. My co-worker and good friend Sue gave me this little hacked photo about a month ago and it’s been posted on my monitor throughout the month of December. Like many, I’m a big fan of The Office. I have been ever since I came across the brilliant original version years ago on the BBC. 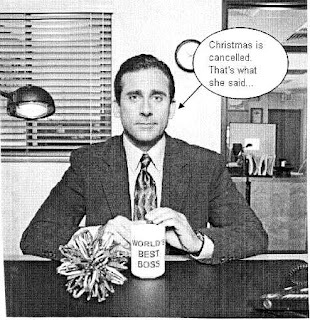 I really felt the Americanized version of The Office didn’t have the same understated spark as it’s British counterpart, but over the past few seasons I’ve grown to really appreciate the differences between the two shows. I very much look forward to rounding out my work week hitting the ‘select’ command on my DVR because I can’t wait to see what happens next between Angela and Dwight. The most recent episode – Moroccan Christmas-was fantastic! I loved poor Meredith Palmer setting her hair on fire while she was dancing drunk at the company Christmas party which led Michael to conduct an impromptu intervention…during the Christmas Party. Only Michael would think that dropping someone off at a rehab clinic was a perfectly acceptable solution to a co-worker’s drinking problem. The poor clueless man never considered that rehab was an option. I recently heard that Jack Black is going to appear in an episode airing after The Super Bowl. I love Jack Black and am really looking forward to seeing what the writers come up with to feature his many talents. I could see him playing a stalker very easily – maybe Meredith’s ex-boyfriend? "I have to go buy a funeral gift." Do you ever have those times when someone does something really, really clever and you're completely bummed out because you didn't think of it first? 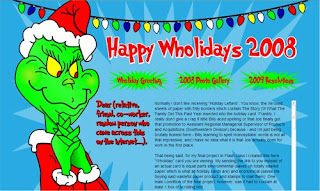 My friend Michelle has put together one hell of a holiday greeting for all of her readers, friends and family and I just had to share it with my own readers, friends and family. Click here to see the AWESOMENESS. Michelle - you continue to inspire me with your amazingly creative 24/7 365 days of existence. You make me want to learn web design something fierce. I know I'm pretty good with the fluffy words, but I could use a little juice when it comes to painting the picture. PS You can keep your boot camp on Saturday mornings. I'll pass. I admit it. I fell off the Jenny Craig wagon back in early October. I was doing so good on the program that I made the grave mistake of thinking I could continue losing weight on my own. What was I thinking? Especially with Halloween right around the corner. As Homer is fond of saying, "D'Oh!" At first I wasn't doing so bad. I continued to exercise and watched what I ate very carefully. But as time passed, I found myself slipping back into my old self-medicating ways. Watching TV while eating a bag of nicely-burned buttered microwaved popcorn sure did make me feel good. Being able to have ice cream again was heavenly. But I received a much-needed slap in the face by my friend and co-worker Michelle. She must have observed me snacking a little too much and had the balls to send me an instant message telling me in no uncertain terms that I was sabotaging myself. I immediately felt my cheeks flush red because it felt like I got caught reaching into the cookie jar. But it was what I needed to hear and what I wasn't allowing myself to act upon. I knew I was out of control. I knew that I made a mistake going off of Jenny Craig and I knew without a doubt what needed to be done. My counselor never had a weight problem and therefore I found it really difficult to relate to her advice. I was getting tired of my weekly appointments getting shifted all over the place based on when my counselor was available. What was once a steady appointment of 5:30pm on a Tuesday turned into appointments after 6pm which resulted in me getting home after work around 7pm or later. The food is really expensive. A frozen meal may cost over $5 when I could buy a similar Lean Cuisine or Weight Watchers meal much less at the grocery store. I was getting really annoyed with my counselor always asking me if I needed any bars or salad dressing or snacks when I tried to cut down my Jenny food purchases. I have a new counselor who has a weight problem herself. During my first appointment with Jackie, she made me feel instantly better by telling me that I should forget what has happened in the past and focus on TODAY. When we talked about events that I had coming up this week, I told her about a Christmas party that I'm going to and she gave me some helpful tips on how to survive it. Not "Don't eat a thing", but rather suggested that I eat my meal before hand and if I find myself wanting to snack choose first any vegetables or fruit that might be offered. But she did also say to me, "It's OK to have a small snack if you need to, but just have one or two." She then offered to call me this upcoming Tuesday to check in with me to see how I did at the party. I found out that I don't have to spend a minimum dollar amount on Jenny Craig food to do the program. I always assumed that I had to and it was such a relief to hear otherwise. I could buy a little or as much food as I wanted each week. My weekly appointment is every Saturday at 10am with Jackie. It's late enough in the morning that I get to sleep in and it's convenient because the center is only ten minutes away from my house. I had my first appointment this past Saturday and it went well. I'm able to forgive myself for falling off the wagon and proud of myself for admitting going off the program was a big mistake. I know that eventually I'll have to learn to maintain my weight loss without eating Jenny Craig food, but for right now it's a very good thing that I realized I can't lose all this weight on my own. I need the help and support of Jenny Craig and in my book that's going to be money well spent - on myself.